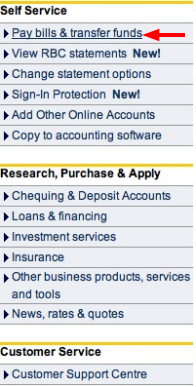 FAQ and Articles - Account to Account Online Money Transfer - for RBC Royal Bank Customers ONLY. 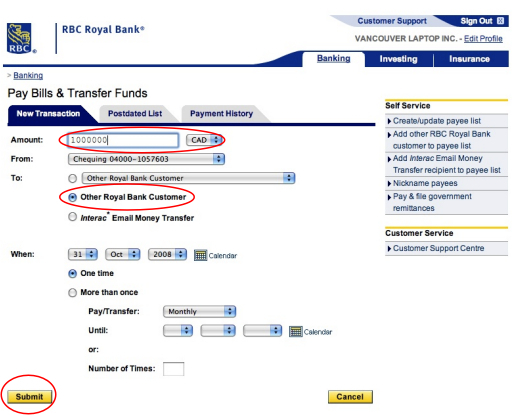 HomeFAQ and Articles	Account to Account Online Money Transfer - for RBC Royal Bank Customers ONLY. RBC Royal Bank customers can pay for their orders using RBC Royal Bank Account to Account transfers. Please, login to your bank account through the bank's website, and click PAY BILLS & TRANSFER FUNDS. 1. Enter the total order amount (it is listed in the confirmation e-mail). 2. Select OTHER ROYAL BANK CUSTOMER. 1. Verify the amount of the transfer. 3. 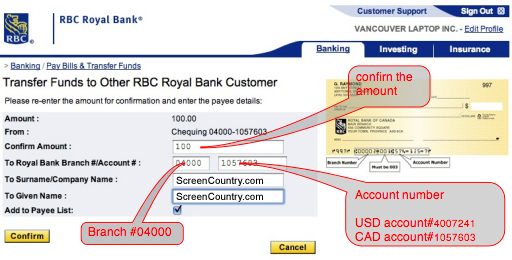 Type in our account number: 1057603 for $CAD transfers; 4007241 for $USD transfers. Once you complete the transfer, please send us an e-mail to [email protected] with the amount of transfer and your order number. Usually, the funds are received within a few hours, and the order gets shipped out the same day.